Linville Gorge – “The Grand Canyon of North Carolina” is the deepest gorge in the eastern United States, and one of only two wilderness gorges in the Southern United States. 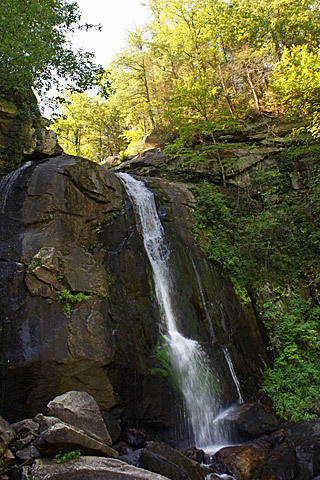 Maintained by the United States Forest Service, it comprises 11,786 acres (47.7 km²) around the Linville River, and is situated inside the Pisgah National Forest. The river is approximately 1,400 feet (400 m) below the ridge, thus hiking in and out of the Gorge is challenging and enjoyable for those who like serious hiking. The plant and animal community is extremely diverse, with a dense hardwood/pine forest and a wide variety of smaller trees and other plants as well as bear, fox, raccoon, trout, grouse, turkey, vultures, owls, hawks, copperheads, and timber rattlesnakes. Click here for a video introduction to Linville Gorge and another video introduction to the Chimneys. South Mountains State Park – South Mountains State Park is the largest state park in North Carolina at 16,664 acres (67 km²) and includes part of the South Mountains, a branch of the Blue Ridge Mountains. High Shoals Falls is the centerpiece of the park. Nestled deep in the woods, South Mountains State Park is the perfect place to enjoy nature. Here you can see a majestic mountain range peeking out from the gently rolling landscape of the piedmont. The park includes elevations up to 3,000 feet and more than 40 miles of trails. From equestrian camping to trout fishing, mountain biking to picnicking, a number of activities are available at South Mountains State Park. Hike the trail to High Shoals Falls to witness the roar of the waterfall as it pours into a large pool. Backpack through the woodlands for primitive camping. Fish for trout in miles of mountain streams, or bicycle along the 17-mile mountain-bike loop. Lake James – Lake James is a large reservoir in the mountains of Western North Carolina which straddles the border between Burke and McDowell Counties. It is named for tobacco tycoon and benefactor of Duke University, James Buchanan Duke. The lake lies behind a series of 4 earthen dams, and was created by Duke Power between 1916-1923 as a hydro-electric project. It still generates power today, and is the uppermost lake on the Catawba River system. Tucked away in rolling hills at the base of Linville Gorge, it covers 6,510-acres, and has more than 150 miles of shoreline. 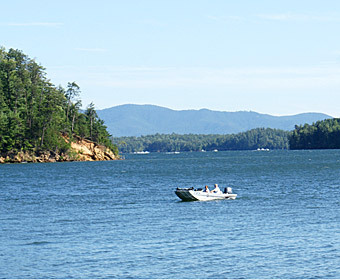 Lake James State Park is the largest waterfront state park in North Carolina, and a potential site for emergency responses. Visitors enjoy swimming and sunbathing, picnicing along the lakeshore, boating, water skiing and fishing in cool mountain waters. Hikers around the lake enjoy an abundance of wildflowers and wildlife along park trails. Lake James offers a variety of ways to enjoy the outdoors.